I have lot’s of costume jewelry, let’s face it we can’t all afford real diamonds. I don’t wear it often so many times I go to pull it out, and it’s tarnished. 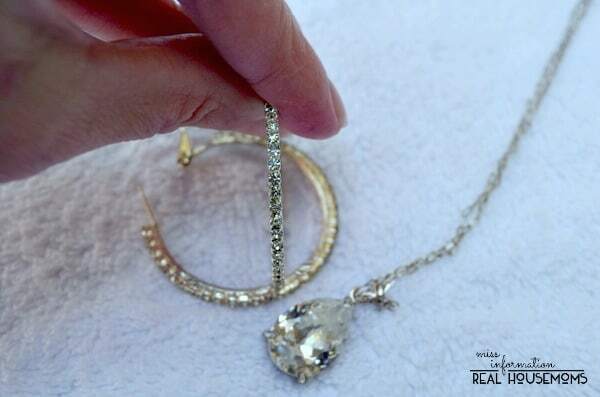 You can’t use regular jewelry cleaner, meant for real stones and metals, on costume jewelry, or it will eat away the finish. 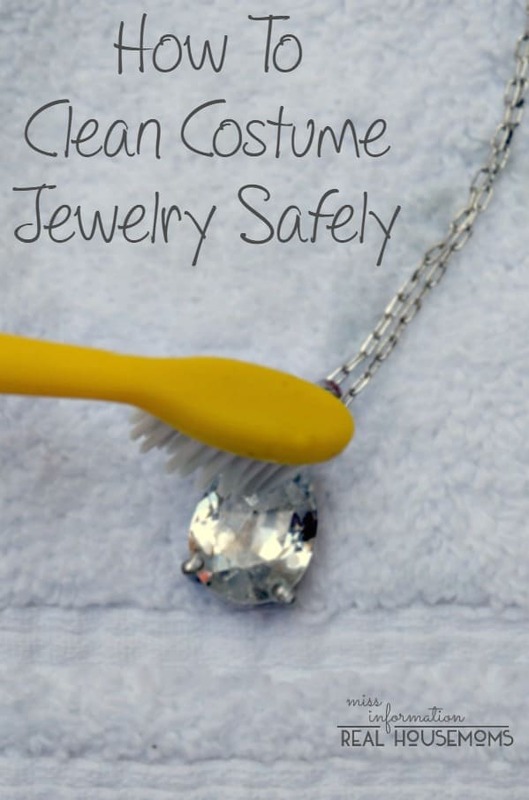 I’m going show you how to clean costume jewelry safely and not ruin the finish. I was getting ready to attend a school fundraiser for a friend of mine and pulled out this necklace and pair of earrings. They were tarnished with some green corrosion on them. 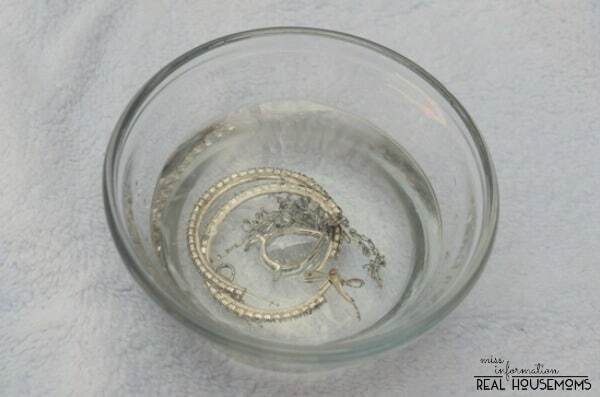 Sterling silver and silver plate have copper in them, so they oxidize from air and body oils causing tarnishing. I recently started using a few essential oils and love them for making homemade cleaners. Lemon is a great essential for cleaning and disinfecting. Take a small bowl and fill it with 1/3 cup of water. Put 3 drops of lemon essential oil in it. Place your jewelry in and let it sit for about 5 minutes. Don’t worry if you leave it in longer it won’t hurt it. After they soak, get out an old toothbrush and a towel. 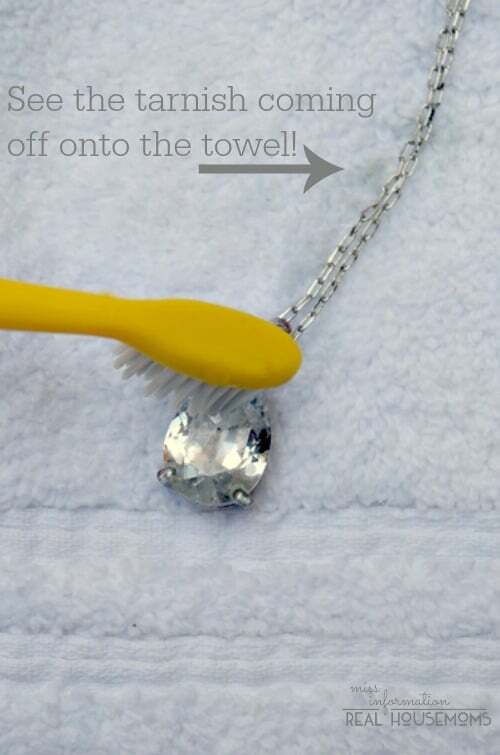 Place your jewelry on the towel and scrub lightly with the toothbrush. You will see the tarnish start to come off onto the towel. Rinse under clean water and wipe dry with your towel. You can see how much better they look now, and their gems are sparkly! By the way, the brown you are seeing in one of the earrings is the reflection of my hand. 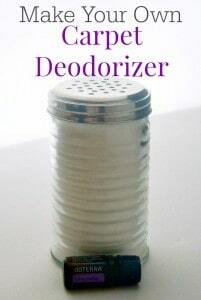 If you’d like to try other cleaning tips with essential oils, you might want to try this homemade carpet deodorizer. It works great, you just sprinkle it on your carpet and vacuum it up. The best part is it won’t make you sneeze from the strong perfume smell! Our fashion jewelry deserve to take care of. So thanks for sharing the ideas and tips on your page! Hi, there! I am happy I landed on your website. I tried it and it worked great. My jewelry are shining like brand new ones. Best wishes! I’m looking at the first picture now – and I wonder. If the toothbrush is not “super soft” it would leave marks on the silver if you push it a bit. Thank you, great tips. I use baking soda with vinegar before, but I will try this. That’s a great way also… You’ll have to tell us which method you prefer after trying this. Nice tips. What do you think about using jewelry machine and using this natural way? Which one is better? Thanks. It’s all dependent on personal preference! 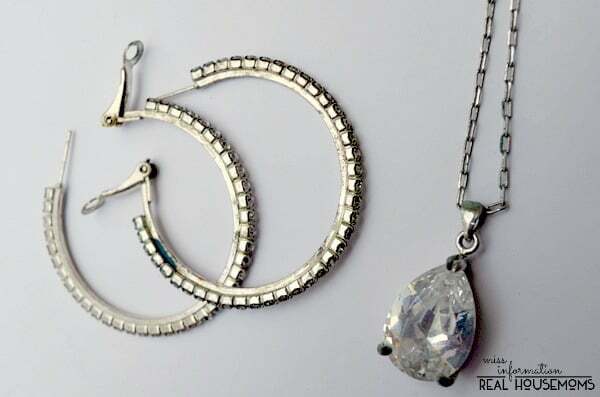 Thanks for sharing a great post with us it really gave lots of ideas to clean a piece of costume jewelry, the tips are given are very helpful to me.